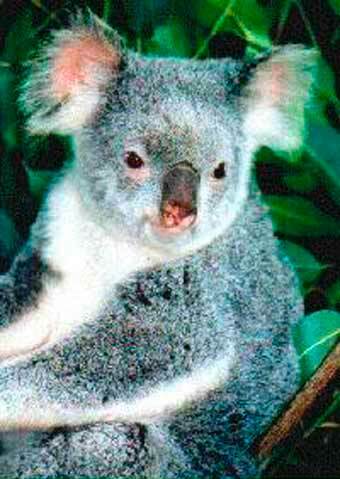 Peacebus went for a slide along the Pacific Highway at 2.45 am this morning and Koala, Spotted Tail Quoll, Yellow Bellied Glider and Masked Owl, were left stranded in Woolgoolga. Peacebus, was hit from behind by a semi trailer, flipped on its side and sent skidding as it was tootling down the Pacific highway on its way taking the critters to the NSW Parliament for Endangered Species Week. Crew and critters were unhurt but Peacebus was more than slightly modified. Its rear end was torn open, and now it rests in a towing yard at Woolgoolga, sag arsed and pathetic. The trailer behind Peacebus was flattened. Fans of Molly and Jolly sheep will be pleased to hear they were agisting in Lismore at the time. But the trailer load of lanterns shredded and the spilled paints and dyes made a colourful mess. The driver of the semi told police he didn't see Peacebus. Peacebus captain, Graeme Dunstan, who was sleeping in the back at the time of the impact, and who makes getting Peacebus noticed an art form, was incredulous. "The next incarnation of Peacebus will, when on the road at night, light up like the Lismore Lantern Festival", Mr Dunstan promised. Meanwhile the critters who were on their to Sydney in search of friends and sustainable habitat, need friends to get them on the road again. As is a tradition now for Peacebus missions, a circle of friends will gather to bless Peacebus and its crew before it departs from Byron Bay for its mission to the NSW Parliament to defend the endangered species of NSW. 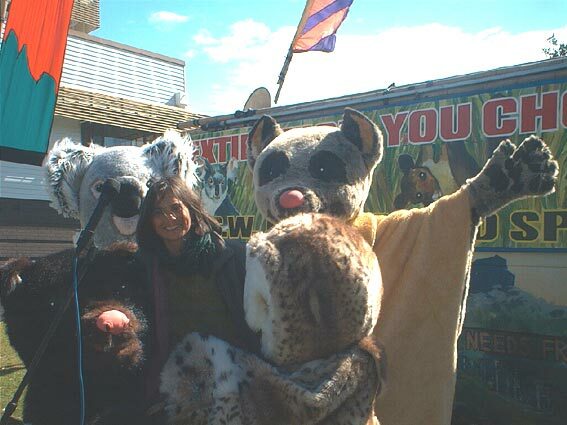 The Endangered Species mission is a collaboration between Peacebus.com, the Rainforest Information Centre, the North East Forest Alliance and four costumed critters, Masked Owl, Yellow Bellied Glider, Spotted Tail Quoll and Koala. 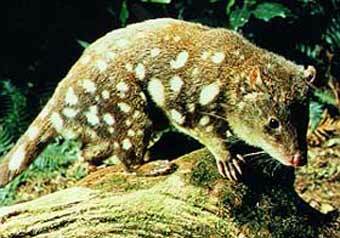 The mission aims to carry forward the ecological defence in NSW and secure habitat to sustain these species. "The critters are going to the Parliament during Endangered Species Week in search of friends and sustainable habitat", said Peacebus organiser, Graeme Dunstan. "The costumes are excellent and the street theatre that will come of their presence can be expected to be colourful and very funny". The Mission Blessing ceremony will be a sharing of music, song, poetry, heart talk and other felicitations. The costumed critters will be there and Peacebus' new livery and banners will be on display. 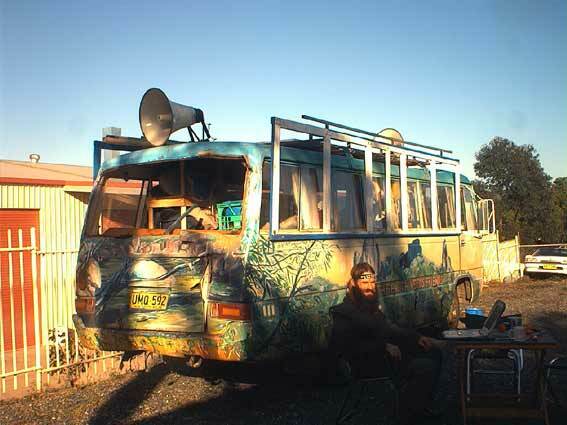 The banners and murals for this Peacebus mission have involved the collaboration of a number of artists including Elspeth Jones and Benny Zable of Nimbin and Judy Cassab and Charles Blackman of Sydney. Peacebus.com is recruiting crew and helpers for a mission that will go to Sydney for Endangered Species Week 1 - 7 September 2002 and bear witness outside the NSW Parliament for the endangered species of NSW. 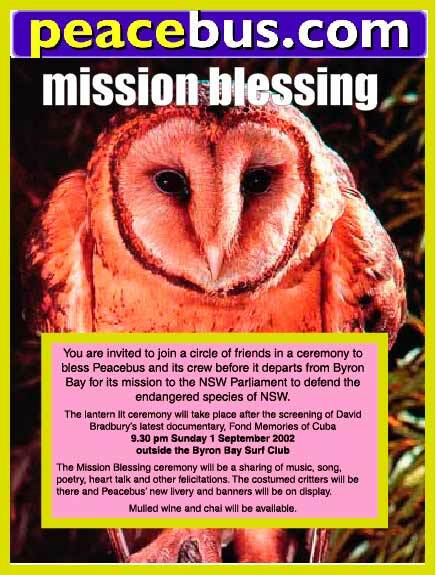 The mission is a collaboration between Peacebus.com, the Rainforest Information Centre, the North East Forest Alliance and four costumed critters, Masked Owl, Yellow Bellied Glider, Spotted Tail Quoll and Koala. 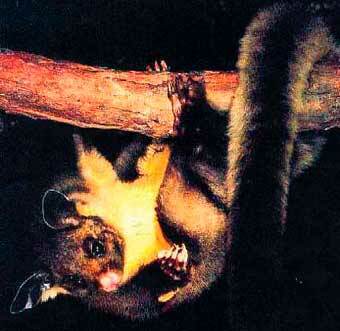 The mission aims to carry forward the ecological defence in NSW and secure habitat to sustain these species. "We are serving notice to the Carr government that it better get green or get out of the way", said Peacebus organiser. "This action will open a campaign in which these endearing, desperate and impatient critters will be touring the towns and suburbs of NSW and searching for help and support all the way to the next elections." "Although the last round of forest battles which culminated in the epic lock-on and tripod blockades at the Chaelundi forest east of Coffs Harbour in 1992, won the protection of over a 1.4 million of old growth and high conservation forests, the Regional Forest Agreements, signed and locked into law by the state and federal governments, have betrayed the critters," said Peacebus captain, Graeme Dunstan. 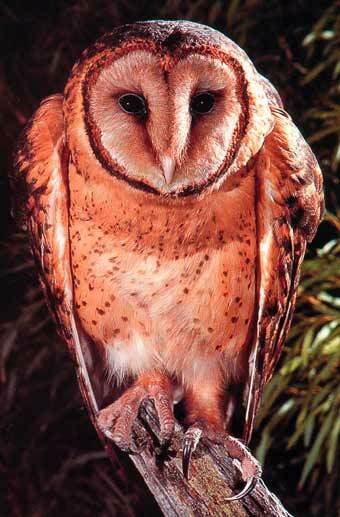 Of the areas of forest habitat needed to sustain endangered species as recommended by expert panels of scientists commissioned by the NSW and Federal Governments as part of the NSW Regional Forest Assessment process, Masked Owl only got 25%, Spotted Tail Quoll less than 20% and Yellow Bellied Glider 20%. "With the RTAs, the NSW government guaranteed 'resource security' to corporate resource consumers, but not see its way clear to guarantee enduring habitat for the humble and harmless", Mr Dunstan said. "We are saying that extinction is for ever and that we choose critters before corporates." At the Parliament between 1 - 2 pm Wednesday 4 September, the Hon Ian Cohen, MLC, will be receiving the critters and the media. Friends of the critters, friends of the trees, friends of the earth, friends on the holy path, Friends of every guise, are welcome to come share some music, song, poetry and heart talk and offer felicitations to the mission. If you want to get Peacebus.com media releases, notice of upcoming actions and reports of those actions, send us @n email and we'll put you on our emailing list. For peace! For justice! For the Earth!